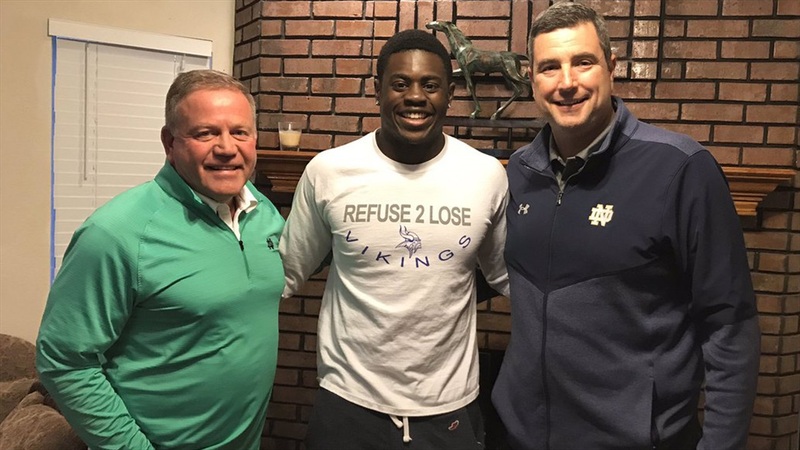 Dave Beaudin has many stories he could tell to illustrate the character of NaNa Osafo-Mensah‍ and the head coach at Nolan Catholic High School shared one of those anecdotes with Brian Kelly when the Notre Dame head coach visited Fort Worth, Texas on Tuesday. “Every decision he makes is with others in mind,” Beaudin says of Osafo-Mensah, the 2019 Irish defensive end commit. “That’s not cliché, it’s unbelievable. So, Osafo-Mensah elected to announce his commitment immediately after his school’s spring game. “It’s the biggest moment of this kid’s life and he’s still thinking about other people,” Beaudin says. Kelly told Beaudin he noticed the same thing, but also noted that Osafo-Mensah is unlikely to feel that kind of responsibility once he gets to Notre Dame. “Basically, he said, ‘If you come in and everyone else is the same around you, then you kind of relax a little bit and you don’t have to do that,’” Beaudin recalls of Kelly’s message. After spending the afternoon at Nolan Catholic, Kelly conducted an in-home visit with Osafo-Mensah and his family that evening. Beaudin was impressed during the time he spent with Kelly, who made the trip along with defensive line coach Mike Elston, who had already made multiple stops at the school. Like Kelly, Beaudin is from Massachusetts. There was no talk about schematics or how Osafo-Mensah would fit within the Irish’s defensive structure. “We didn’t talk about it once,” says Beaudin. “Everything was about character. It just wasn’t in the conversation.